Amidst occupations and uprisings, mass mobilizations and stirring campaigns this year, the question of how to best connect our ideals with more pragmatic considerations has been a constant refrain. Discussions about tactics and their philosophical underpinnings have gotten particularly heated. Often these debates have been based as much on rhetoric and theory as on a careful reading of actual history. Recent articles on this site by Stephanie Van Hook and Cynthia Boaz have addressed these concerns in poignant ways. And while I feel indebted to these, I have grown less interested in the debate between so-called principled nonviolence and strategic nonviolent action, which I fear may at times be doing more to maintain false dichotomies than to build movements which make these ultimately simplistic terms as insignificant as they nearly always have been in times of tumult and rebellion. Decades prior to pitching my own tent somewhere along the continuum of definitions of violence and nonviolence, I was primarily an activist. New York City then was fraught with every small, sectarian grouplet, with leaders of every major and minor leftist tendency divided by every FBI Counter Intelligence Program trick in the book. It seemed only logical to try to get people with essentially similar ideas to at least occasionally work together. Of course, nonviolent activists or pacifists made up only a small (but influential) percentage of those seeking peace with justice. In that context, I felt pushed to be less of an “absolute” pacifist (or absolute anything) and more of a revolutionary, less of an ideologue and more of a pragmatist. One of the first lessons I learned was to take a long view of history. The struggle, as has often been said, is long and protracted, and there are no easy victories. In that sense, there was also much to learn from the old timers who had come of age in hard times — but not, interestingly, veterans of the high and heady times of “the sixties.” Those folks told great stories, mainly about their own adventures, but the real insights were from the World War II resisters, those long-distance runners who dared to stand up against a popular war. Isolated as they were, they found allies wherever they could. Similarly, if revolution is not likely “just around the corner,” we advocates of revolutionary nonviolence must take a measured and kind look at all colleagues who might share even part of our hopes for a world without war, violence or oppression. My role was never to tell the people in the African anti-colonial movements how best to wage their struggles or build their movements. My job was to help get the boot of the oppressor — often propped up by our own government — off of their backs. requires us to adopt a principle about human beings and human dignity: we will not use violence against others because we want to create a vibrant culture, a merciful culture, a generous culture because we as human beings have the potential to nurture these qualities within ourselves and each other. How best to do that, then, is the question we must keep asking ourselves. There are concrete, historical incidents in which principled pacifists stuck to their ideals about not engaging in individual acts of violence, but were blinded to the larger issues of institutional violence being perpetrated against those socially considered “others.” These incidents seem more than simple coincidences; they suggest fault lines, especially along race and class, where one set of principles contradicted or trumped another. Sometimes without self-awareness, time and again, pacifist attempts to create a nonviolent culture (especially a single, white-washed or homogenized culture) led to acts which served to solidify institutional violence. 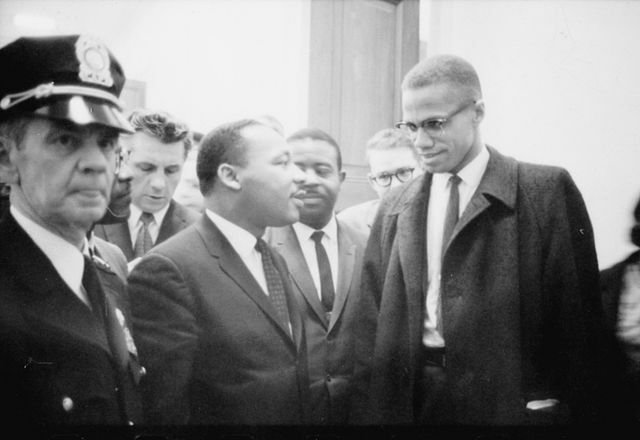 Similarly, through ignorance or distance from those oppressed peoples struggling for justice “by any means necessary,” even when they were often predominantly using nonviolent tactics, “First World” pacifists missed — and still miss — the vital lessons offered by people who could easily be our closest colleagues. It’s important that we be honest with ourselves about past and present errors, in ways meant to neither embarrass nor condemn those involved, but to work toward a better path forward. Some nevertheless still argue that practitioners of philosophical nonviolence should only “express solidarity with avowedly nonviolent movements or organizations and not with anyone else.” But this history of ideals gone astray should lead us to be more cautious than that pronouncement. A growing consensus is emerging of an understanding of the dialectical connection between principle and practice. This consensus happily has its own roots in the history of nonviolent direct action in the U.S. and elsewhere. In fact, a review of the teachings and influence of Bayard Rustin, who was also a World War II conscientious objector, reminds us that Dr. Martin Luther King Jr. himself adapted Gandhi’s techniques, coming first from a position which accepted armed self-defense, after being convinced that the Indian methods were not just moral, but practical. Gandhi himself, as Gene Sharp and others have documented, was a wily strategist who well understood the connections between tactics and principles. In order to best understand the perspectives of the world beyond empire, groups based in the Global North must totally uproot themselves from imperialism and all its trappings; organizations and individuals must make clear in all their writings and speeches and actions that they stand with the oppressed. As has been noted, this has proven more complicated than might be expected. Far too often, the dividing line is a culturally loaded notion of doctrinaire nonviolence, leading some First World advocates to “loves enemies” amongst the apologists for an imperial status quo which quietly condones or ignores structural violence, while feverously criticizing potential “friends” amongst oppressed people who may only use nonviolent action as an occasional tactic. The call for a clearer articulation of “revolutionary nonviolence” is, in part, about putting an end to the false principle-strategy divide. If a study of conflict — its causes and potential resolutions — seeks long-term peace and change, this field must embrace more than reformist visions of the ending of specific wars one at a time or the eradication of violence one gun at a time. A revolutionary approach can surely accept short-term reformist goals. Ultimately, however, an end to violence — structural and otherwise — will require an end to our militarized societies supported by taxes, an end to exploitative economics and the politics of dictatorship. In short, the development and experimentation of a theory and practice of revolutionary nonviolence is not only the most logical extension of the lessons of peace studies, it is a theory which naturally leads us to specific further study and action. It seems that in order to properly understand, study, and develop nonviolent revolution, one must analyze the world from a truly anti-imperialist, internationalist, holistic and Global South perspective. One must not only understand the dialectic of strategy, tactic and principle, and of means and ends, but of the ongoing urgency to tackle the shackles of gender, race and class. On the narrow but important path of discrediting the false dichotomy of principle and practice, Cynthia Boaz beautifully reflected that “commitment to the principle can evolve from the action, which itself is the result of the strategy.” In an email to the Peace and Justice Studies Association list-serve, Boaz put it even more poignantly: “Strategy,” she asserted, “is the form that the active manifestation of the principle takes.” It would seem, then, both self-limiting and morally questionable to cut one part of our potential beloved community off from another. Though no less a believer in the power of the people and the potential of nonviolent civilian resistance, these examples continue to shake me to a position of openness, of a “kindness” not just to individuals, but to communities in struggle even in ways I might choose not to personally engage in. Both principled and strategic nonviolent activists have had their share of elitist behaviors which have alienated potential allies and adherents. Much of the rest of the left may be even worse. But if we are to hold to a high, pro-justice moral framework, we should first admit that principles and practice must always be connected if either is to have meaning in our movements for peace. The whole world waits for the U.S. left — progressives, pacifists, socialists, anarchists and others — to grow up. If we can move beyond our dogmatic (often ego-driven) rigidities, if we can admit, confront and learn from our mistakes, if we can merge principle and practice — especially in the fight against white supremacy, patriarchy, and economic injustice — we will have come a long way indeed. Debates and discussions have their time and place, and we will continue to make mistakes as our movements grow. But now is the time to build bridges, careful to avoid the mistakes of the past. Now is the time to put our principles squarely to practice, and come together in the streets. Even here, we are waiting for the left to “grow up”. They are constantly looking for the wrong kind of leadership. Despite the slagging of the 60s above, my experience was one of praxis. Many of us lived the ideals that we championed while attacking the “system”. When I talk with young people now, they have no vision. Nothing which describes an ideal of how they want to live (although many are desperate to find one). They talk about supporting Bolivian miners, but can’t find a local issue which exemplifies the conflict they feel. Their goal is always how to overthrow the system; not how to win a well-thought-out campaign to weaken that system, while building their own. It might be time for the veterans to come out of political retirement to create some models for this generation. We need to create a continuity. Where are the creators of the “Port Huron Statement”? Where are the creators of co-ops; the women’s movement; the anti-war movement; the civil rights movement? How can they connect to Occupy? (a vision-in-the-making). After a year of trying to describe some alternative methods to a variety of local groups, I’ve decided to create a campaign in the hopes that it might say it better. I’m in if you have a place to tie up too. Do you have a name for for campaign yet? Thanks for this, Matt. It reminds me of an incident a few months ago when I attended a day-long training in non-violence. There was a longtime activist–someone old enough to remember the anti-apartheid struggle–who insisted that Nelson Mandela was devoted to non-violence. While I have huge respect for Mandela, I think that it’s important that we not white wash his history as one of the prime advocates for an armed struggle in South Africa just so he can fit into our current image of him as the sweet old man who brought everyone together. I do think it is more respectful of people to tell the truth about their histories. Good article, Matt, as far as it goes. But it didn’t go far enough.